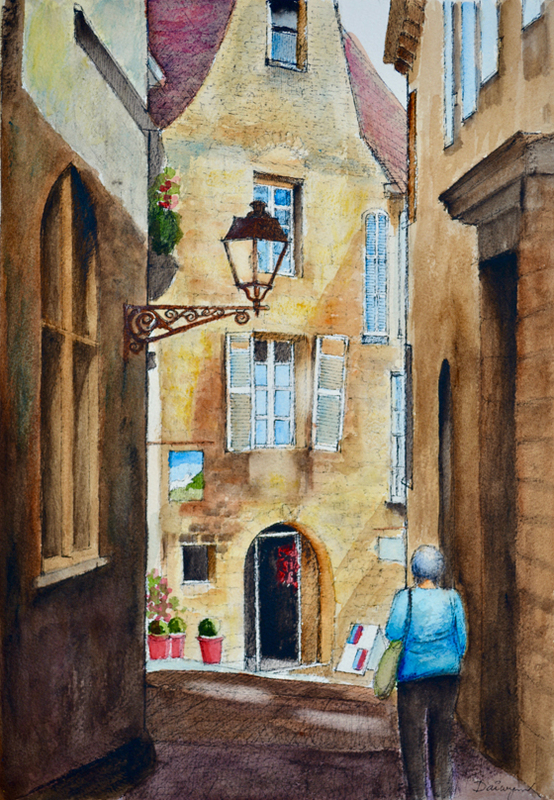 A typical sandstone house, now a shop, in la vieille ville (the medieval centre) of Sarlat-la-Canéda, Nouvelle Aquitaine, France. While a new glass door in the stone arch provides access to a shop, the wooden shutters on the window above the door are about to fall off with age. 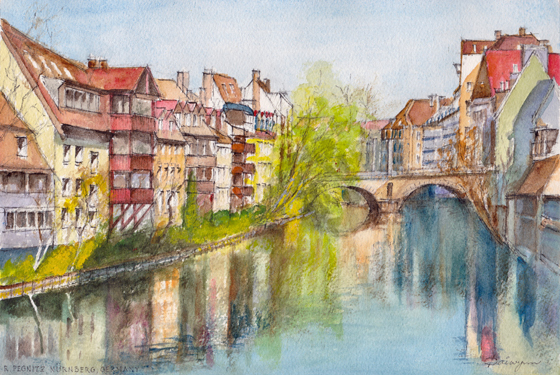 Ink and watercolour painting by Dai Wynn on 300gsm rough surface Arches cotton paper. 42 cm high by 29.5 cm wide by 0.1 cm deep approximately. A3 standard size. 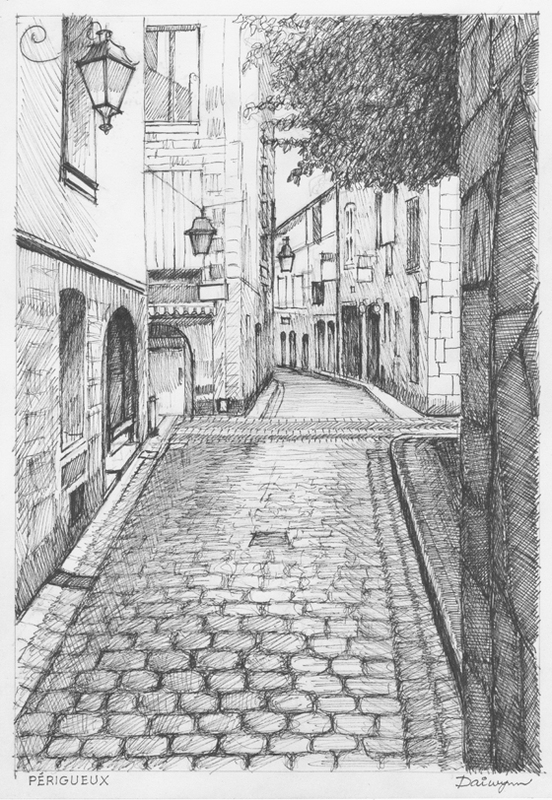 Pencil and ink sketch by Dai Wynn of a cobbled street in the old town (La Vieille Ville) of the city of Périgueux on the Dordogne River in Nouvelle Aquitaine, France. I am always delighted by how well the French maintain their heritage (la patrimoine), while providing all modern services to residents and merchants. All electricity, gas, water, drainage and sewerage has been hidden beneath the cobbles while maintaining the patina of age on the sandstone of buildings. Perfect for a black and white rendition. Drawn in black ink with a 0.2 mm pen on 300gsm smooth surface Arches paper. 29.5 cm high by 21 cm wide by 0.1 cm deep. A4 standard size. OK, so I painted my ink sketch with watercolours. One of the wonderful things about old European towns is the way buildings are coloured. 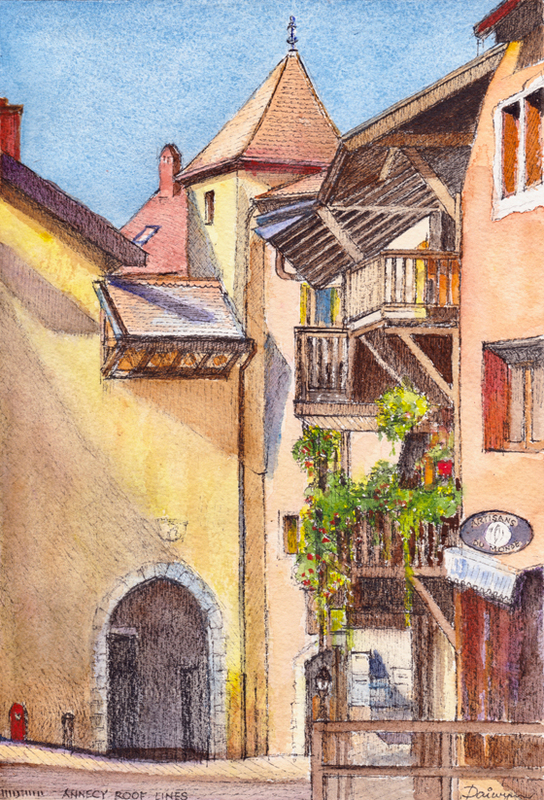 Annecy in south eastern France is no exception. To add to the fascination, this part of the old town has a wonderful collection of roof lines. 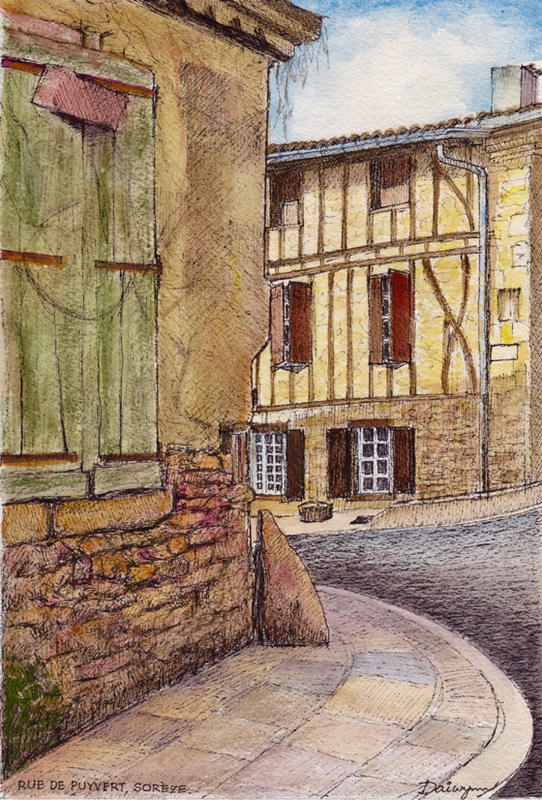 Ink and watercolour painting by Dai Wynn on 300gsm rough surface Arches cotton paper. 29.5 cm high by 21 cm wide by 0.1 cm deep approximately. A4 standard size. 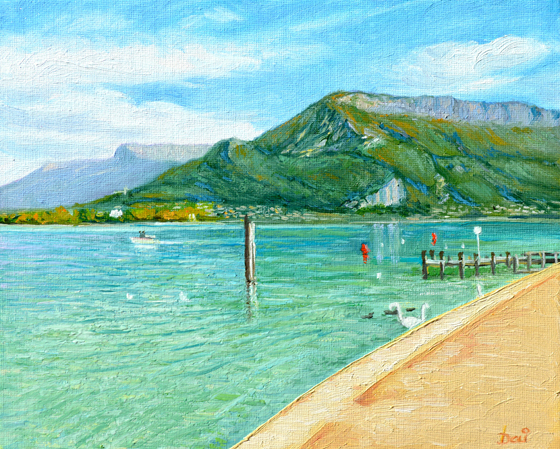 Annecy Lake at Annecy, south eastern France, near Genève. Noted for its pure water, it lies surrounded by the French Savoie Alps. Oil painting by Dai Wynn on canvas panel. 20.3 cm high by 25.4 cm wide by 0.3 cm deep approximately. (8 inches by 10 inches). 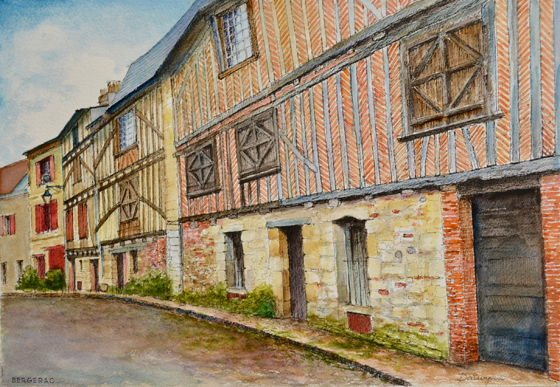 A row of medieval brick, timber and stone houses in rue de la Mirpe, Bergerac, Nouvelle Aquitaine, France. Ink and watercolour painting by Dai Wynn on 300gsm rough surface Arches cotton paper. 29.5 cm high by 42 cm wide by 0.1 cm deep approximately. A3 standard size.